The iPhone maker and auto parts retailer both made unusually strong moves higher toady. Stocks logged strong gains today. The Dow Jones Industrial Average (DJINDICES:^DJI) gained 192 points, or 1.1%, and the S&P 500 (SNPINDEX:^GSPC) rose by 22 points, or 1.1%. 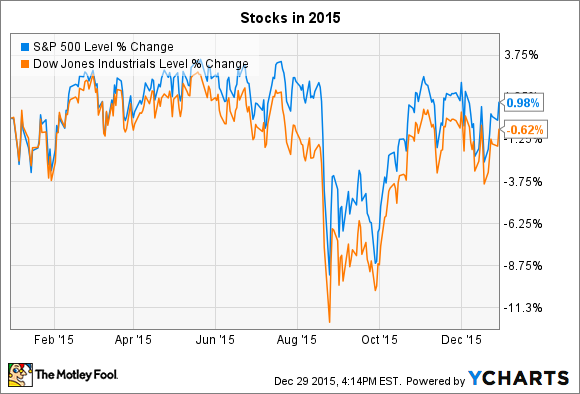 With just two trading days left in 2015, the S&P is 1% higher, year-to-date, while the Dow is down just slightly. Investors received two pieces of positive economic news this morning. First, the latest consumer confidence survey showed an uptick in confidence that was driven by an improving outlook for the job market . Second, housing prices managed a solid 5.2% gain in October, according to the S&P Case Shiller Home Price Indices. As for individual stocks, Apple (NASDAQ:AAPL) and Pep Boys (UNKNOWN:PBY.DL) made unusually large gains today. Tech titan Apple was the second best performer on the Dow, with its 2% gain marking a slight rebound from the 10% drop that shareholders have seen in the last month. The stock is now sitting at roughly where it started the year -- running about even with the S&P 500. The recent dip came as investors worried that iPhone demand may be slowing. A few Wall Street analysts have predicted that the iPhone 6s might not sell as briskly as Apple had hoped. Others, including those from Raymond James, are on the record warning that this iPhone cycle won't be especially strong. The firm's early December web survey suggested that "modestly fewer iPhone upgrades are likely in the coming 3 and 12 months than a year ago." Meanwhile, research firm IDC is predicting that the current quarter will mark Apple's first one in which iPhone sales decline, year-over-year. On the other hand, there are reasons to remain optimistic. CEO Tim Cook told investors in late October that management believes iPhone will mark growth this quarter. "We base that on what we are seeing from a switcher point of view -- we recorded the highest rate on record for Android switches last quarter at 30 %," he said. Market share gains, along with a huge base of users ready to upgrade from older generation iPhones lays out a "very open field," according to Cook. Automotive parts and service retailer Pep Boys jumped 9% higher today on news that the bidding war for the company -- between investor Carl Icahn and Japanese tire maker Bridgestone – has crossed the $1 billion mark. Icahn raised his offer to $18.50 per share, which Pep Boys said now represents the leading bid for its business. 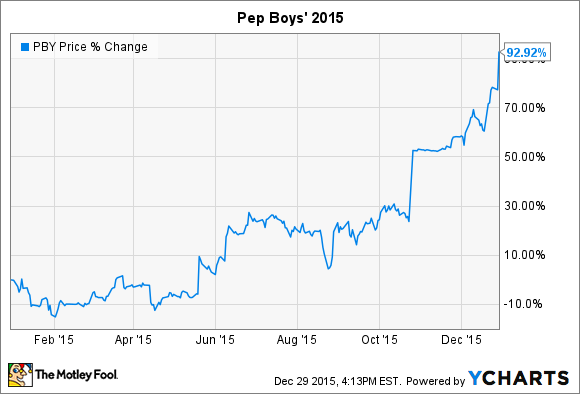 With today's advance, Pep Boys' stock is now up by a whopping 93% in 2015. That leap has come despite unimpressive earnings results. The company said earlier this month that comparable-store sales fell slightly over the last nine months. Sure, Pep Boys' year-to-date profit improved to $18 million from a loss of $1 million over the same period in 2014 and gross profit margin held steady at 30% of sales, but customer traffic trends aren't pointing in the right direction: Pep Boys suffered a decrease in both its merchandise and service sales for the third quarter. Yet investors seem to be banking on more gains ahead. The stock is trading at above the latest bid price, suggesting that shareholders believe a higher offer might be on the way.